Do you have a bushfire plan for the 2016 fire season? Every organisation or community group who operate out of premises that are near dense forest, bush, grass land or the coast need to prepare for the threat of fire and bushfires, and decide on fire plans now. and practice your bushfire plan. The more you prepare your property the better the chance of surviving a bushfire, even if you are not there. Write down your bushfire plan, communicate that plan and know if you have the clothing, equipment or resources to enact your fire plan to leave early or stay and defend. 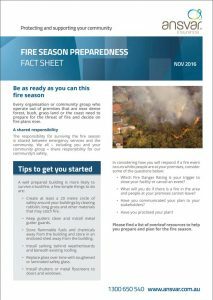 A prepared and practiced bushfire survival plan will help your community group and organisation know where others are and what they’ll be doing should an emergency occur. Be prepared, confident and more in control so you can cope should a disaster strike. The responsibility for surviving the fire season is shared between emergency services and the community. We all – including you and your community group – share responsibility for our community’s safety. -Keep gutters clean and install metal gutter guards. -Store flammable fuels and chemicals away from the building and store in an enclosed shed away from the building. -Install sarking behind weatherboards and beneath existing roofing. -Replace glass over time with toughened or laminated safety glass. -Install shutters or metal flyscreens to doors and windows. -Which Fire Danger Rating is your trigger to close your facility or cancel an event? -What will you do if there is a fire in the area and people at your premises cannot leave? -Have you communicated your bushfire plan to your stakeholders? -Have you practised your bushfire plan? *This material is for information purposes only. It is not intended to give specific legal or risk management advice nor are any suggestions, checklists or action plans intended to include or address all possible risk management exposures or solutions.